Roll the dice and fill all fields with the bonus multiplier until you finish them all. Try to get the best scoring group and multiplier to get maximum points in the game. 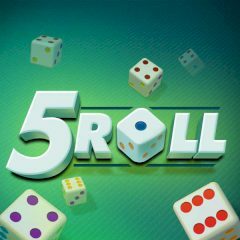 5 Roll is the game for people who loves the games with strategy and tactics. From the very start of the game you will have to think hard in order to get maximum points at the end of the game. Knowing the rules and the points you get from scoring groups you can choose which field to fill right now and what multiplier you should set.